We need to completely re-evaluate our approach to exercise given the weight of current evidence. Back in the days when physical activity was a natural part of our life and daily habits, it was assumed that we took enough steps to interrupt the damaging metabolic effects of prolonged sitting frequently enough to disrupt fat storage and inflammation. So with this foundation of baseline essential non-exercise physical activity (NEPA), the recommendation was to add on an additional 4-5 exercise sessions a week. The core of NEPA includes activities like walking, climbing stairs, picking up objects off the ground and doing some squatting, all of which used to be a natural part of daily movement. It’s tragic that we now have to create a separate term for this (NEPA) and make a deliberate attempt to restore it into our daily, unnatural sedentary lifestyles. My patients today are sorely lacking NEPA which I simply quantify through daily steps using a pedometer or activity device (Fitbit, Up Band, etc.). 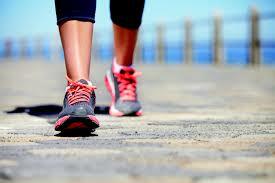 A 20 minute walk at lunch is better than nothing, but not nearly enough to get you to your NEPA goal. The bare essential daily minimum is 5,000 daily steps and optimal is 8,000-10,000 steps or more. Since I measure this often enough, I can tell you my average Silicon Valley sedentary employees get an abysmal 2,000-3,000 steps daily. I encourage you to know your number and if you are not getting sufficient NEPA, prioritize that first. If you look at parts of the world where people live the longest, they aren’t doing intense daily cardio workouts, running or cycling countless miles, or attending bootcamps. They simply walk, stand, bend and squat more throughout the day, and do much of it outdoors. I also want to highlight that nearly all of the health risks I see in my patients can be improved by walking more steps. Studies show that walking lowers blood sugar and triglycerides after meals, it lowers inflammation, it modestly lowers body fat, it lowers stress, improves immunity, prevents falls in the elderly, and increases longevity. What other evidence do you need to get you walking more? Once you get your NEPA to a reasonable level, now you can start layering some cardio workouts and weight training a few times a week, but DO NOT use those exercise sessions as a replacement for NEPA. A compilation of 18 studies including nearly 800,000 people done by UK researchers showed that prolonged sitting throughout the day doubled the risk of diabetes, heart disease and death despite moderate-to-vigorous exercise. Another study done in those 60 and above showed that regardless of exercise, every hour spent sitting doubled the risk of becoming disabled. Bottom line is 30-40 minutes on the elliptical doesn’t earn you 12 hours of sitting. Frequent, intermittent movement with the right eating strategy not only helps burn fat, but it also reduces inflammation, which is at the root of all chronic diseases (heart disease, cancer, Alzheimer’s, etc.) and premature aging. In addition, keep in mind that there is a growing body of evidence showing that continuous chronic endurance training may actually increase heart disease risk. If you are an avid distance runner or triathlete and want to live longer, it may be wiser to switch your running shoes for walking shoes every now and then. The Wall Street Journal did a story on this here. Don't get me wrong. Achieving your endurance goals or a personal best in your favorite exercise (running, cycling, etc.) or sport is a great accomplishment, but keep in mind that the real accomplishment for most of us is longevity, disease prevention, and optimal brain and body health. For these goals, NEPA is absolutely essential. Is there a fitness band that tracks NEPA? My husband and myself read your book” The South Asian Health Solution ” in June 2015 on my visit to San Jose, California.It is a wonderful book giving all the recent advances which one can follow and benefit.Both of us are diabetics and by adopting lifestyle changes have been able to reduce our antidiabetic drugs . Our triglycerides level have also improved remarkably.My husband is a physician and myself a Paediatrician .Now we intend using the suggestions for treating our patients. Thanks a lot ,hoping to get more information about the recent advances from you. Thanks so much for your kind feedback about the book and happy to know it will influence the advice you give to patients.